The number of calories you burn while walking will depend on your weight and how fast you walk. The more you weigh, the more calories you will burn. Walking faster also increases the caloric burn. A 125-pound person walking at 3.5 miles per hour, or a 17-minute mile, would burn 108 calories in 30 minutes, or 61 calories per mile. A 155-pound person walking a 17-minute mile would burn 76 calories, while a 185-pound person would burn 90 calories. By increasing your speed to a 4.5 mph power walk, at 13 minutes per mile, you can also increase the calories burned per mile. A 125-pound walker burns 77 calories, while a 155-pound person burns 96 calories and a 185-pound walker burns 115 calories per mile. 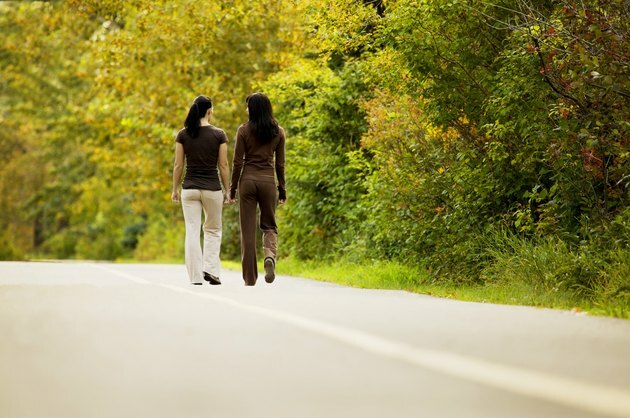 Walking can help you lose weight, improve cholesterol, lower blood pressure, manage diabetes and boost your mood. Walking is the ideal exercise for some people because it is low-impact, safe and simple. Low-impact exercises don't put stress on weight-bearing joints. Wear walking shoes and comfortable clothes. Choose clothes appropriate for the weather. Warm up at a slow pace for five minutes to prepare your muscles. Stretch to prevent injury. Cool down to reduce stress on your heart and muscles.